(Newser) – A new computer climate model has turned up the strongest evidence yet that a planet in the Gliese system is capable of sustaining life, the Telegraph reports. 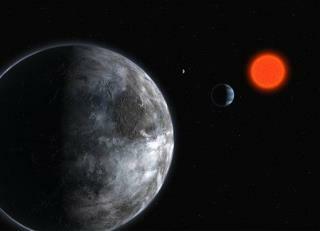 Researchers believe Gliese 581d, which orbits a red dwarf 20 light years away, not only exists in the "Goldilocks zone" where water can be present in liquid form, but is big enough to have a stable carbon dioxide atmosphere and "warm enough to have oceans, clouds, and rainfall," according to France's National Centre for Scientific Research. Keep in mind that this is the same star system that got all the attention late last year. Gliese 581 G and D may both be stable, but that's like looking at Earth and Venus from afar. It is, however, just a matter of time before these data come into laser focus and we find liquid H20 -the exoplanet holy grail. We find the planets, zero in and wait. It takes a while but I promise, this is just the beginning. We at NASA are cautious cats, but this is why we do what we do!